In our world where emerging technologies are increasingly a source of significant disruption in people’s lives, methods from Speculative & Critical Design (SCD) practice are finding their way into the designer’s and researcher’s toolkit as powerful ways to create new kinds of meaning and perspective that create new organizational value. These practices design future products and services not in a predictive way, but as a way to prototype and understand the social, cultural, and ethical implications of emerging technologies. These practices generally decouple design from short-term company product and market needs and visions, and engage in new conversations about alternative futures as a way to better understand and navigate future complexity. SCD often works to design for the messy and complex people that we are rather than the perfect consumers that we are supposed to be. The practices seek to challenge narratives about probable futures, allowing organizations to openly explore various possible futures as a way to better understand alternatives and preferable directions forward. Additionally, the increasing speed of technological development mean that many projects considered futuristic come to fruition much faster than expected, which necessitates that companies spend time looking further into the future to better anticipate and develop understanding and meaning around these possibilities. SCD has proven valuable in a number of domains and throughout the design process from research & strategy to design & development. And while to date SCD has largely been practiced by designers who are gifted at imagining, exploring, and bringing unique speculative visions of the future to life they are sometimes poorly equipped to understand the reactions to these designs. This represents an opportunity for additional engagement from researchers, anthropologists, and ethnographers to support SCD practice with skillsets that can work to better unpack and created meaning from people’s reactions to these speculative futures. 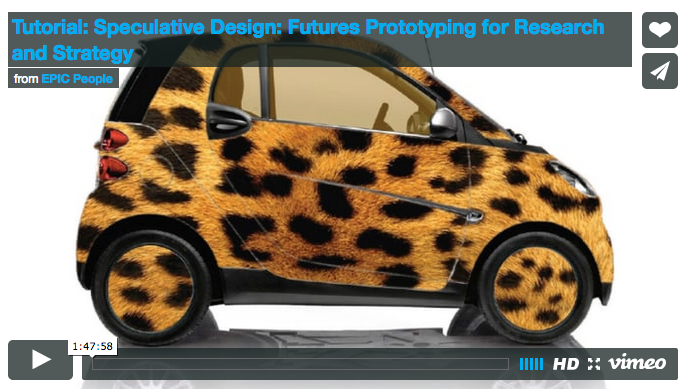 In this tutorial we worked to bring participants up to speed on the latest speculative design practice, explore its value as a research tool and for the development of strategy, and worked through an exercise for participants to gain some experience with these approaches. The goal was for participants to leave with a foundational understanding of Speculative & Critical Design principles and methods, a collection of top of mind examples of SCD in practice, to have the experience of an SCD exercise, and to be able to understand the value of SCD methods for research and strategy development and identify when SCD methods might be appropriate for use. The tutorial was open to all backgrounds, both researchers and designers, with no prerequisites or particular skills sets needed for participation. J. Paul Neeley is a service and speculative designer exploring the social, cultural, and ethical implications of emerging technologies, with recent projects on happiness, healthcare, future mobility, and issues of complexity and computational irreducibility in design and business. He is consults in service & speculative design at Neeley Worldwide with clients like Moovel and the Policy Lab UK, and is a visiting lecturer in Service Design at the Royal College of Art. He has worked previously as a service designer at Mayo Clinic Center for Innovation and researcher at Unilever. He hold a Masters in Design Interactions from the Royal College of Art in London and a Bachelors in Communication Studies and Economics from Northwestern University. Elliott P. Montgomery is a researcher and strategic designer whose work focuses on speculative alternatives at the confluence of developing social, technological and environmental issues. He is an Assistant Professor of Strategic Design at Parsons School of Design and co-founder of The Extrapolation Factory, a futuring research initiative. He has practiced as a design consultant for clients such as Autodesk, GE, LG, Honeywell, and UNICEF, as well as for tech startups and non-profits. He holds an Masters in Design Interactions from the Royal College of Art in London and a Bachelors in Industrial Design from Carnegie Mellon University.